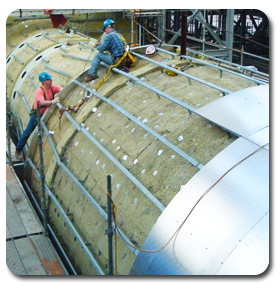 Unitherm is a major independent commercial and industrial insulation, lagging, scaffolding and heat tracing contractor headquartered in Charlotte, North Carolina, with locations over the southeast. Unitherm’s history began in 1924. Dedicated and committed employees are the backbone of our business. We believe that work should be a fun experience. New employees who are committed to excellence are treated with patience. Fair salaries are only one component of our employee benefit package. Other components are: Health and Major Medical Insurance, Dental Insurance, Life Insurance, Medical and Child Care Flex Plans, Long Term Disability Insurance, paid holidays, paid vacations, employee bonuses, and a Profit Sharing plan. Employees will never be asked, expected, or allowed to do anything dishonest, unethical, or illegal. Employee ownership creates synergy, a competitive spirit, and attracts innovative people. The Company is owned entirely by the active employees. Unitherm has a history of financial success through commitment to serve credit worthy customers, continually looking for new products and opportunities; and by investing in new technology. Unitherm stands as a benchmark of financial integrity for specialty contractors. We have a reputation for honesty, integrity, fulfilling our promises, and meeting customer needs in a timely manner. We have never defaulted on a contract. Unitherm is committed to serve credit-worthy customers by providing timely responses and accurate estimates; and investing in new technology, equipment, and training. Unitherm strives to keep these customers by building, developing, and maintaining good relationships. We offer something extra. We keep our promises. We give more than expected. We consistently and genuinely show them that we appreciate their business. Copyright 2011 Unitherm, Inc. All rights Reserved.